A new textbook for undergraduates on cosmology is being created! As well as hardcopy content, it will also have interactive 3D capabilities to allow readers to look at and analyse cosmological data sets and models. Glen Mackie and Christopher Fluke from the Centre for Astrophysics and Supercomputing at Swinburne University of Technology are currently writing the textbook for Cambridge University Press. Since the radio signature of our own Milky Way was detected in 1931, galaxies have been observed from ultra-high energy gamma rays to long wavelength radio waves, providing fundamental insights into their formation, evolution and structural components. Unveiling the secrets of some of the best-observed galaxies, this atlas contains over 250 full-color images spanning the whole electromagnetic spectrum. The accompanying text explains why we see the component stars, gas and dust through different radiation processes, and describes the telescopes and instruments used. 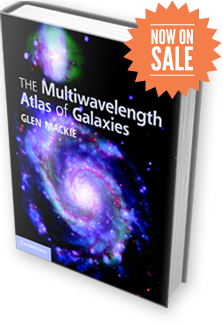 This atlas is a valuable reference resource on galaxies for students seeking an overview of multiwavelength observations and what they tell us, and researchers needing detailed summaries of individual galaxies. "In this excellent atlas, Glen Mackie of Swinburne University of Technology, Melbourne, has collected images of familiar and less familiar galaxies at various wavelengths and comparable scales, showing how key features of galactic form and evolution are picked out in cool dust, hot gas and spectral emission, to name but a few." "This volume will be a nice addition to any reference library, as well as to the personal bookshelves of researchers and graduate students. Its purpose is to illustrate the full breadth of properties seen in galaxies at high resolution, using the latest data in all wavebands. This it does admirably. Mackie (Swinburne Univ. of Technology, Australia) makes use of a restricted, "atlas sample" of 34 galaxies chosen from every class. The author selected these objects for both their proximity to Earth and the amount of data available. The data are of the best quality and the breadth of properties illustrated is tremendous. One could quibble with a few choices; in particular, none of the elliptical galaxies used are of the "nonactive" variety, and the dwarf classes are not fully sampled. However, these are minor issues, especially given the quality of the work and the usefulness of the images in this book. Summing Up: Recommended. Graduate students and above."